From time to time, we will be bringing you the very best Stephen King merchandise and Stephen king collectables and this little beauty caught our attention the moment we first saw it. Stephen King’s The Dark Tower series is the gripping tale of the last gunslinger in Mid-World, Roland Deschain, who is traversing the post-apocalyptic landscape in search of the magical and elusive Dark Tower. In The Dark Tower, direction and time drift and the very fabric of reality itself is fraying. Roland needs to find a way of saving the six beams to keep space, time, dimensions and size in alignment. Part Tolkien and part spaghetti western, Stephen Kings Dark Tower is a tale of epic proportions and this amazing handmade Dark Tower Clock will be the perfect Stephen King collectable for any Dark Tower fan. We will soon be launching a full range of Stephen King merchandise on The Stephen King Store, but this clock looks so cool, we thought we’d bring it to your attention straight away. Each of these vintage style Dark Tower clocks are made by hand in the TO Studio and shipped directly to you. These handmade clocks aren’t delivered next day, because they are made to order and shipped out individually, but that just adds to their uniqueness. TO Studios is a small team of designers based in the Ukraine, so this is not the usual mass produced Stephen King merchandise that you may have seen before, and at only $38.99, it is amazing value for money too. 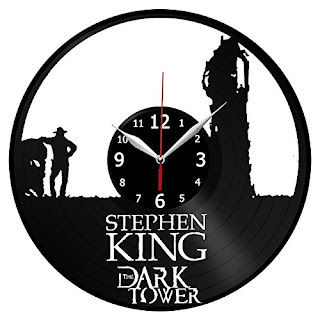 With a distinctly retro feel, the 12 ½ inch vinyl record just seems so right for a Stephen King Dark Tower clock. It would look great in a home office, in a kitchen, or any wall of a Stephen King fans home. So, if you are looking for a unique Stephen King gift, or you are a Dark Tower fan yourself, buy your Dark Tower clock from Amazon below. It’s fully guaranteed too, so if it does get broken in transit, TO Studios will send you a replacement.